Children discover affordances in the physical environment, sometimes it is characterized by pure imagination and association. We call that kind of affordances “as if” and one example is when the children at Technichus Science Center, with terrified delight, discover ghosts in the interactive sandbox. This article covers analysis from interviews and observations from two different parts of exhibitions at Technichus; the Geology Exhibition as well as an area with Playground building pads. In 2016 Technicus and the Mid Sweden University started a collaboration. The Liminal Space research project was started, focusing on physical spaces and materials and its effect on creativity and understanding. We searched for more knowledge about learning environments that could help us plan, design, and improve particular learning environments in order to create opportunities for entrepreneurial learning. Entrepreneurial skills such as creativity, understanding and critical thinking were of particular interest. During the research we became interested in which components that are crystallized in the planning and development of an interactive exhibition. How can you describe and understand the motives behind the exhibition? What is behind the planning, what are the performances/agendas about what children are thought to do? Gibson's (1986) theory of affordance can be used to understand people's interaction with the physical environments on a specific and individual level. However, some environments have affordances that are easy to collectively discover while other environments are more difficult to interact with, which means that different actions can take place. Previous studies (Eriksson Bergström, 2013) have shown that when environments or materials are static and with a high degree of predetermined planned offers, children discover a narrower variety of affordances. When they played in the rooms for role-play, they played what was expected to played there, i.e. they discovered the offers they were thought to discover. There were also Role-plays to play in environments with more neutral materials to use. These games were more varied, as the children discovered a wider variety of affordances in these environments. When children were playing in these more neutral environments, they also talked more to each other (Eriksson Bergström, 2013). A child playing with sticks, who wants to play “ice-cream stand” with a friend, contacts the friend and says "Now, this is a pear ice-cream and this is a strawberry ice-cream". Then the friend can join the play, and the play continues evolving into an “ice-cream stand”. How can we explain what happens in the “ice-cream stand”? The neutral material like sticks has a broad variety of affordances that encouraged the children to talk and negotiate with each other. The play then became more collective. In other situations when children plays with more planned and predetermined materials, they did not need these verbal negotiations. What was said in the interview? Data in the project is based on observations from various environments at Technichus which are designed to stimulate creativity and entrepreneurial skills. We have also supplemented these observations with interviews with educators working in these environments. Ideational analysis of interviews deals with what the exhibition is meant to communicate to the visitors. The educator mainly explains what the Geology Exhibition is about, what facts there are to be conveyed. Based on this object, different contexts are planned, which then create a main thread in the exhibition. During the interview, the educator gives examples of the exhibition, planned to convey facts and understanding about different types of rocks. For example there is a possibility for the visitors to call a geologist, which can be understood as something that creates a red line for the intended learning object. There are also motives in the exhibition that are not clearly planned within the frame of the learning project, intended to convey facts. These motives can be understood and derive from the perspective of a child/recipient agenda. The exhibition planner expresses this by saying "kids like this" or "children need this". Children's “needs” are then referred to their level of development, such as having recorded facts or instructions since all children cannot read. 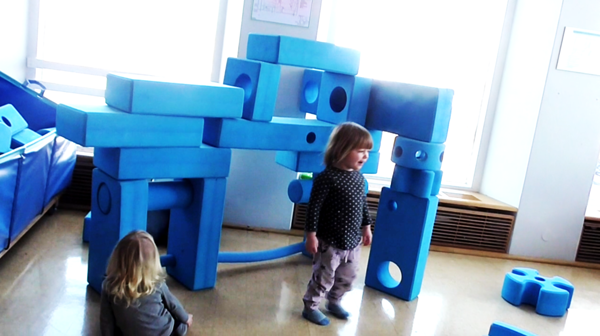 The motive for the Imagination Playground area is to offer children the opportunity to construct; to build and join together large objects, sometimes as big as the children themselves, and to be inside the constructions. There is a common awareness that children need the opportunity to work and build together to learn about design and construction. Some affordances in the Geology Exhibition are motivated by the intention of attracting the target audience. For example, there are digital elements motivated by the fact that it is contemporary and something that children of today feel familiar and safe with. Finally, there are affordances that aim to be a moment of surprise, for example something happening suddenly, such as a sound or something jumping up. There are also aesthetic affordances, the exhibition should also be aesthetically appealing. In summary, the learning object in the geology exhibition certainly belongs to these different types of affordances, but it is also clear how a variation of other affordances with different motives than the ideational aspect are planned into the exhibition. What affordances did the children discover? According to the ideational aspects of the geology exhibition, the pedagogues try to direct the children's attention to these offers. However, aspects like novelty and excitement affects the children's actions so that they in a relatively voluntary way discover different offers in the exhibition. They also express verbally what they want to do. In the geology exhibition for example "Now I want to dig in the sand" or "Now I want to work with the crane". Sometimes when they get in contact with offers too difficult for them, they express “You could do that!” This is when they have discovered an affordance, but need help from a more competent person to add actions to the actual discovery. In some situations there are no problems. The discovery of new affordances leads to knowledge and reflection, unless something else attracts the attention. Sometimes children discover affordances that are characterized by pure imagination and association. We have named the category “As if something else....!” One example of this is when children discover ghosts in the blue light in the Interactive Sandbox, or when they get excited in the cave in the geology exhibition. When we analyze the actions that occur at the Imagination Playground, it becomes clear that all these categories of affordances exist at the same time. The interaction with this more neutral, unplanned material causes a variety of actions to occur. Their actions are characterized by Come on! Look at this! ", That is, a fascination for the material, for the amount and shape of the building pads. The more intentional actions, characterized by Come on! Look at this!”also become clear since the children make long-term plans for the building-project. They are also challenged to repeatedly discover“As if something else....!" affordances. Imagination Playground building blocks are put together into stairs, flagpoles and balance paths, which in themselves act as arrangements that lead the game and the imagination to new and increasingly complex associations. Can this kind of material serve as a spatial prerequisite for creativity and entrepreneurship? Are there any markers of creativity? Creativity has been regarded as a personal trait that some people own. We used to believe there is only a limited number of people blessed with creative talent. Today, however, creativity researchers describe it as an interpersonal process, and an interaction between individuals. It might be possible that creativity also depends on the interactions between individuals and the physical learning environment. So, could there be spatial conditions for creativity? Creative acts can be described as combinatorial actions that combine and create new ones, based on previous experiences. This combinatorial ability is considered to be creativity and imagination. The analysis of the observations and the interview regarding the Geology exhibition and Imagination Playground points to the fact that children discover a variety of offers in a different way from what the pedagogue was telling. The neutral and unplanned tools like the Imagination Playground stimulated children to discover a variety of offers. In the Imagination Playground, several different entrepreneurial skills were also visible. The children could clearly transform ideas into action in the building constructions they undertook. They communicated and collaborated more clearly than in the Geology exhibition. This study shows the importance of being aware of how people discover individual offers in the surrounding environment when planning future exhibitions with the aim to create opportunities for entrepreneurial learning. Clear learning objects, which will convey facts, needs to be planned with offers that can be detected by variation. The study also shows that the more the children interacted with neutral materials, (such as the Imagination Playground), the more they transformed their ideas into action. With the aim to progress within their projects, they showed entrepreneurial skills such as courage and risk-taking. But above all, they communicated and negotiated with each other more closely. Environments within a Science Center can be thereby be seen as important prerequisites for developing entrepreneurial skills. 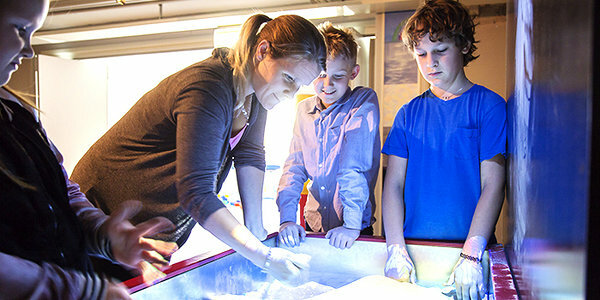 We believe that the challenge for educators and exhibition planners at Science Centers is to balance clearly formulated learning objects with environments planned for the unplanned.